Cuba, 20th century. "15 Anniversario de Cinemateca de Cuba", screen print illustrated by Antonio Fernández Reboiro (Cuban, b. 1935- ), published by Instituto Cubano del Arte e Industria Cinematográficos (Cuban, founded 1959), circa 1975, signed and dated in print at center right margin "Reboiro/75". 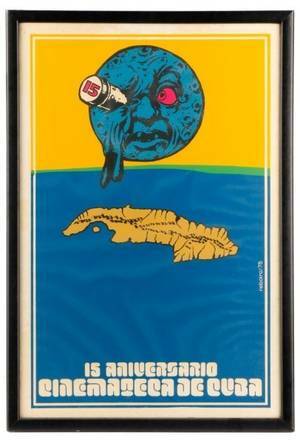 Print depicts the island of Cuba beneath an oversized, humanized moon with looking glass held to his right eye, the lens inscribed in neon fuchsia with the number "15", with inscription to lower center "15 Anniversario de Cinemateca de Cuba". Framed approximately 31.5" x 21.6". Sight approximately 29.5" x 19.5. Note: This poster was generated for the fifteenth anniversary of Cuban Cinema. The Cuban Institute of Cinematographic Art and Industry (ICAIC) was founded by the Cuban government in March of 1959, after the Cuban Revolution. The moon and spyglass imagery refer to the 1902 French silent film, A Trip to the Moon (French: Le Voyage dans la Lune), directed by Georges Méliès.